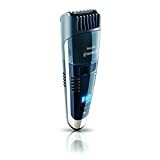 Are you tired of reading promotional articles, that only try to endorse that their particular beard trimmer is the best beard trimmer on a market today ? Of course we are all smart enough to realize that every company is going to claim their product to be the best on the market. Why should we trust the articles or reviews we find on beard trimmer brand websites? This is why more and more people are taking a different approach to their own product purchasing research. Consumers are becoming smarter and finding better ways in determining what product is right for them. One of the best ways to determine if a product is worthy or not, is by reading reviews, and comparing prices on sites like Amazon.com. However, you need to be analyzing the right information – to quickly determine what products you can trust. 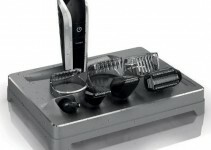 If you are also looking for a good Electric Shaver, then check out this page! Use the guide below to help you in your search for the best beard trimmer for your needs. Continue reading to learn how I found my top 5 beard trimmers picks. 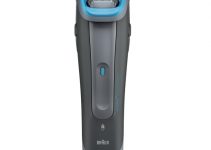 This one happens to be in my top 5 pics for best beard trimmer and I have written a full review – so if this trimmer is of interest to you, read it below. Below is a sample of comments from Amazon customers Pros & Cons. One of the common complaints read in reviews – was the design of the comb. Originally the trimmer only included a stubble comb and it’s design was flawed with sharp tines with which you could cut/stab yourself. This is no longer a problem due to the manufacturer now including a second contour comb with purchase. Compared to any other trimmer on the market, I venture to say this is the most superior. The QT4070 has a gap between the top guard and the side guard, which leaves the cutting surface more exposed. While this does a great job as a shaver the implementation of the vacuum is flawed. Between these three trimmers, This is the one I would choose as it is a great beard trimmer. It’s an All-in-one hair/beard & body trimmer – with an extremely easy to use adjustable comb length dial. That will allow you to adjust to up to 19 different cutting lengths from 1-10mm. The unit is also fully submersible – So cleaning and shower use is no problem. 50% of the current customer reviews give this trimmer a 5 star rating. Precision-cut stainless steel, fast action blades are Hypo-Allergenic, Rubber Grip handle for easy handling. Includes AC Recharger stand with indicator, Cleaning brush and 3-Comb Attachments, also includes Replacement Blade WER9606P. Cordless operation of 50 minutes on a 15-Hour charge. 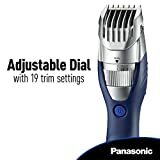 Notice that the Philips Norelco QT4000/42 Beard Trimmer only has 63 reviews and is the cheapest of the three trimmers. This is surely why its rating is high and with the low cost, most likely why it is one of the best best beard trimmer sellers as well. Of course there are many other trimmers that are in the same price range who didn’t make the list. So, if you don’t want to break the bank and are not to concerned with getting exceptional quality. Than the Norelco QT4000/42 should be a good choice for you. After reading some of the reviews myself, most of the comments echoed the same results. For example one said “Very decent, nothing outstanding. But does what it should do.” Blade quality seems to be good and battery life as well. Battery holds a charge well and last long time. The shortest comb setting is not that short. Without the comb attachment (using just the cutting blades) it’s not as short as others. A beard trimmer is similar to electric hair trimmers that you see at barber shops or hair salons.However, beard trimmers are specifically designed to conform better to a mans facial contours. A beard cutting gadget that makes personal facial hair care easier… offering you more benefits than the old school razor and scissors. These contouring functions found in some beard trimmers – will give you more control and better precision when trimming your mustache, shaping your gotie or managing unruly sideburns. Some standard hair clippers have beard trimmer capabilities built in – so depending on your needs you may want to find an all-in-one model. As mentioned above – beard trimmers are hair clippers designed specifically to trim facial hair using either a rotating or oscillating razor. Depending on the models design, trimmers will cut facial hair to desired length – shaping your beard, mustache, gotie, sideburns or can be used to remove hair completely. Most beard trimmers these days are battery powered and also come with a power adapter to re-charge unit. Although, if you are wanting a more powerful trimmer – the old plug-in only hair trimmers will give you more torque than a battery powered trimmer. These can be beneficial for those of us who have coarse hair. The various types of trimmers on the market today include: All-in-One trimmers, which are designed to cut long or short hair – beard, head or body grooming as well as dual trimmers, where one end is a beard trimmer and the other end is an electric shaver. Or, if your just need a standard beard trimmer there are tons to chose from as well. Design features can help you manage long hair, a short stubble look, shape/groom mustache, goatee or sideburns. There are many different kinds of beard trimmers with different features, including removable or built in distance combs for styling different lengths of facial hair. Some even have memory feature that allow the user to set the trimmer to a particular setting or adjustable speeds to cut and shape coarse or thin hair. Some beard trimmers are designed with an ergonomic handle, so you can use the trimmer at different angles with ease. Some are fully water resistant so you can even use in the shower and many if not fully submersible are designed to be washable – so you can get those pesky hairs out with ease. Many rechargeable beard trimmers have an LED charging light that indicates when the unit has reached its full charge. Ultimately having a good Beard trimmer at home will give you quick access to maintaining a clean looking beard, goatee, or mustache. Keeping our facial hair tidy on a daily basis is what were all hoping for when looking for a quality beard trimmer. Beard trimmers can also provide a more precise trimming than disposable razors or an electric shaver, and can be used to trim or shape most lengths of hair around the face and neck area. Depending on the model you decide on – you may need additional grooming tools for getting those hard to reach places. Always trim your beard when dry, wet hair will always appear longer, which can result in trimming more than you intend. 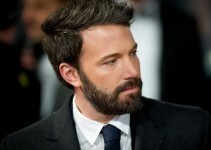 If you sport a longer beard, than it is always a good idea to comb (straighten) hair before trimming. 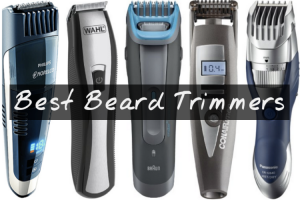 With the vast amount of trimmers and options to choose from…my top 5 picks were determined based on my own preferences. So, this list is not intended to persuade your purchasing decisions. 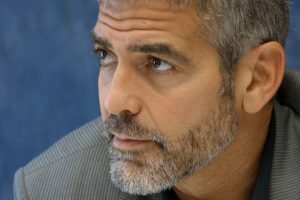 However, if you have the same needs for facial hair grooming as I do – any of these 5 trimmers would be a great choice. I have coarse/curly hair and try to keep my facial hair at a short length. If my hair gets to long it will curl up and cause irritation. I also like to keep my facial hair clean and neat – so I needed a device that would give me more shaping precision and with close shaving capabilities. I also like the dual end designed groomers that makes it quick and easier, to go from trimmer to electric shaver. An all-in-one hair and beard trimmer is also nice…since my hair tends to grow fairly quick. Allowing me to maintain my short hair on my head as well. My life is very busy, so a trip to the barber shop is few and far between. Price – What are you willing to pay? What is a reasonable price range for your budget? Blade Precision – What kind of blades does the beard trimmer have and how well does it work for any beard lengths? Does it have adjustable beard length options? Does it have a memory setting to remember your specific speed/shape and length? 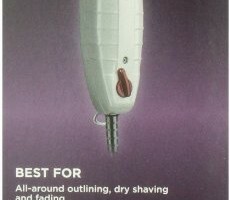 Ease of Use – How will the design of the trimmer help me shave? How heavy or bulky is the trimmer? Will it’s design help me in the shaving process. Does it have too many features you won’t need? Battery life – What type of batteries (if battery operated) are used? Are they rechargeable? How long will it take to charge and how long will they last? ? Features – What features will help you and which ones could you live without? Durability – What are your expectations of how long your next beard trimmer will last? Warranty – What kind of warranty (if any) is offered when purchased. The best way to determine if a product is worthy or not – is by reading customer reviews. Customer satisfaction is what we are looking for. However, you need to be careful – looking at the rating of a product and reading a few reviews may not work for you every item. For example: A beard trimmer with a positive rating of 5 stars with only a few reviews is not necessarily better than a trimmer with hundreds of reviews and a rating of 4 stars. Also, you need to determine how long a particular trimmer has been on the market. This is usually why it may not have as many reviews. This can make it very difficult to analyze, especially if you don’t have the time to read lots of reviews. Google search the keywords – Best Beard Trimmers and Best Stubble trimmers and look for the Amazon listing for each keyword entered. They will usually be in the top 5 positions. 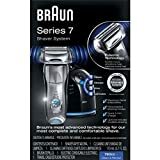 These will give you an Amazon list of the top 100 trimmers for best selling and top rated beard trimmers. Only look at the top 10 items and analyze their ratings and review count. This is not a perfect science and you should always still take into consideration what you want in a beard trimmer as well as customer satisfaction. Nevertheless, this is a quick way to narrow your search. Below is a chart of the top three beard trimmers that I have determined by combining top rated and best seller beard trimmers. Another great way to narrow your search is to use our interactive Complete Beard Trimmer Comparison Guide. Where you can quickly sort through trimmers by most expensive to least or highest percentage of 5 tar rating to least and more.